Heat 6 tablespoons oil in a large pot over high heat. Add the rice to the pot and stir to coat with the oil. Pour in the water, add the salt, and put the lid on the pot. Boil the rice over high heat for 3 minutes, then reduce the heat to medium. Steam the rice for 15 minutes. While the rice is cooking, prepare the toppings. Put the almonds in a saucepan, fill the saucepan halfway with water, and boil for 5 minutes over high heat. Drain the almonds and slip their skin off by squeezing them between your thumb and forefinger. Cut the almonds in half (or keep them whole if you like). Add the oil to the saucepan and heat it over medium heat. Throw in the almonds and toss them around until they begin to brown. Remove the almonds with a slotted spoon. Throw the raisins into the same saucepan, toss them around for 2-3 seconds, then take them out. In the same saucepan, stir-fry the vermicelli until golden brown. Pour in the water, add the salt and turn the heat up high. When the water has evaporated, reduce the heat to medium and put the lid on the saucepan. Steam the vermicelli for 10 minutes. 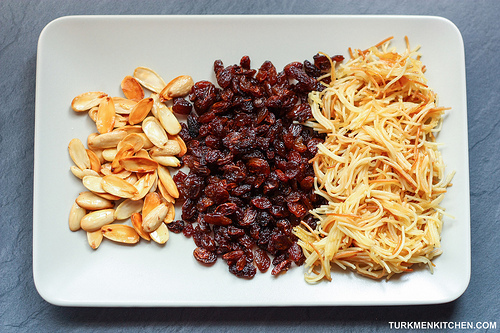 Scoop the rice onto a serving platter and garnish with the almonds, raisins and vermicelli. 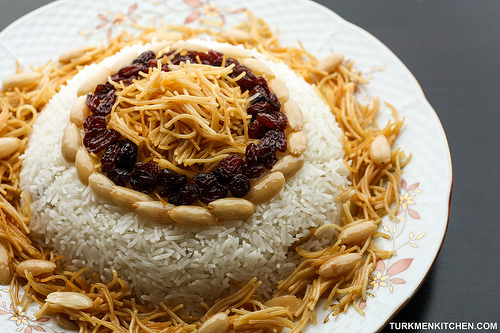 Pilaf goes well with chicken, beef, lamb, or salmon.